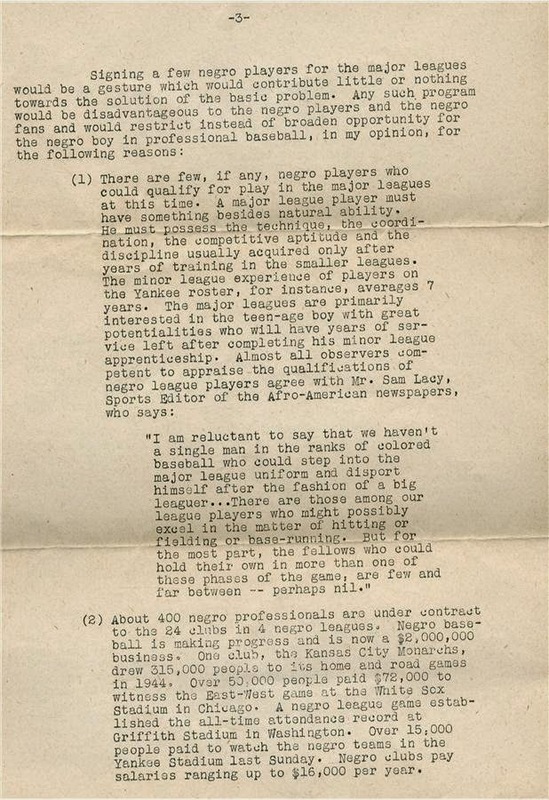 From Branch Rickey's elaborate plans to Jackie Robinson's ability to rise above the hate, we are all familiar with the folks behind the integration of Baseball. But, do you know much about the forces working against breaking the color barrier? 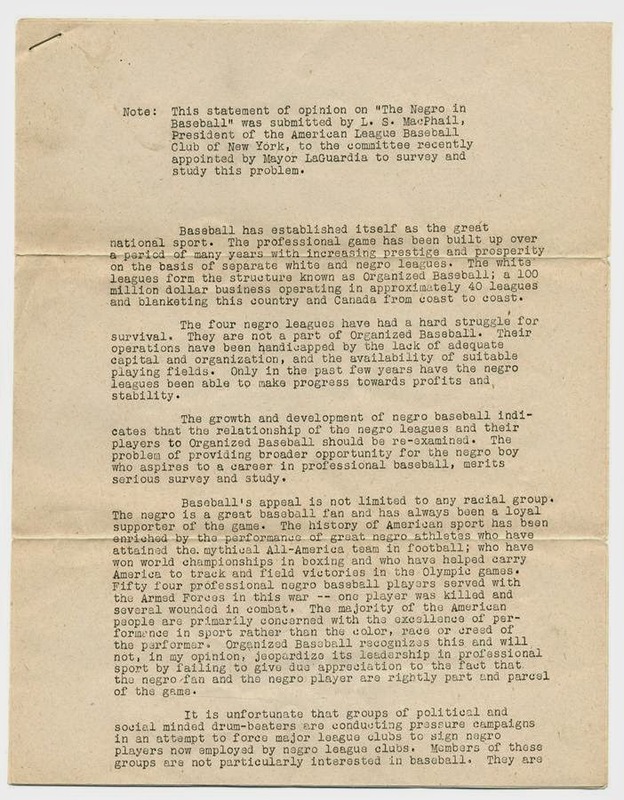 Per an item currently available for sale through Lelands Auctions we learn a bit more about an influential Baseball insider who was opposed to change and his reasoning. The below 4-page letter is known as "The MacPhail Report" and it details all of the often irrational and obviously racist thinking of the time. It was penned by Larry MacPhail - one time Dodger President and General Manager, and then current co-owner and General Manager of the Yankees - in 1945. Read it in its entirety below. 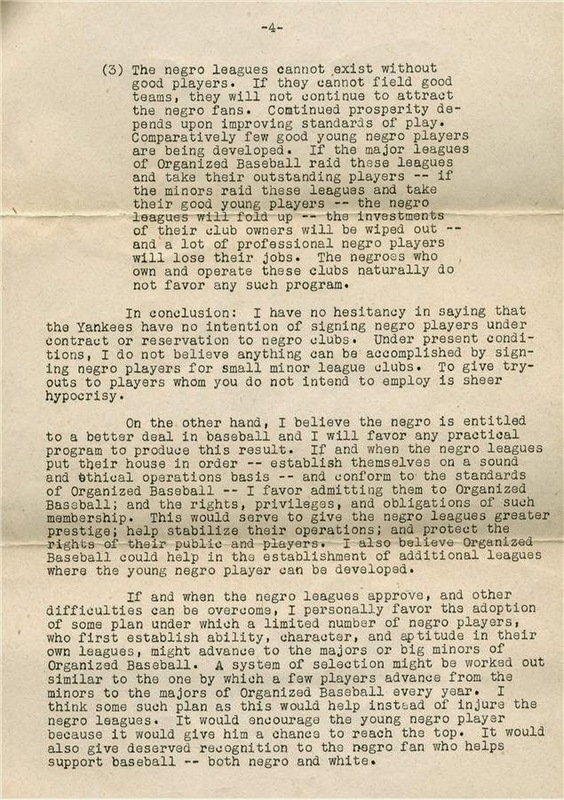 Written in the same summer that Jackie Robinson was tearing up the International League with 40 stolen bases, 113 runs scored and an ultimately league-leading .349 batting average, the report observed that there was a tremendous increase in black attendance at all the games in which he played, and that in two Triple-A cities—Newark and Baltimore—blacks accounted for more than half the attendance when Robinson’s team, the Montreal Royals, came to town. 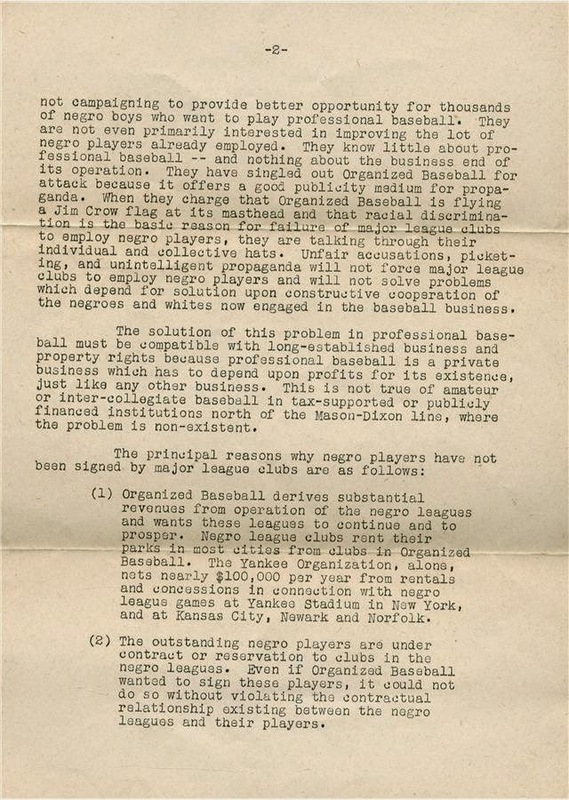 As paying customers, they were surely contributing to club coffers, but the MacPhail Report warned that such levels of black attendance in ballparks such as Yankee Stadium and the Polo Grounds in New York City and Comiskey Park in Chicago “could conceivably threaten the value of the Major League franchises owned by these Clubs.” The report did not specify Ebbets Field, which all concerned certainly knew was Jackie’s ultimate destination. It should be noted that MacPhail specifically states in the letter that the Yankees would not be integrating any time soon (that didn't happen til 1955). Nevertheless, MacPhail was admitted into the Hall of Fame in 1978.